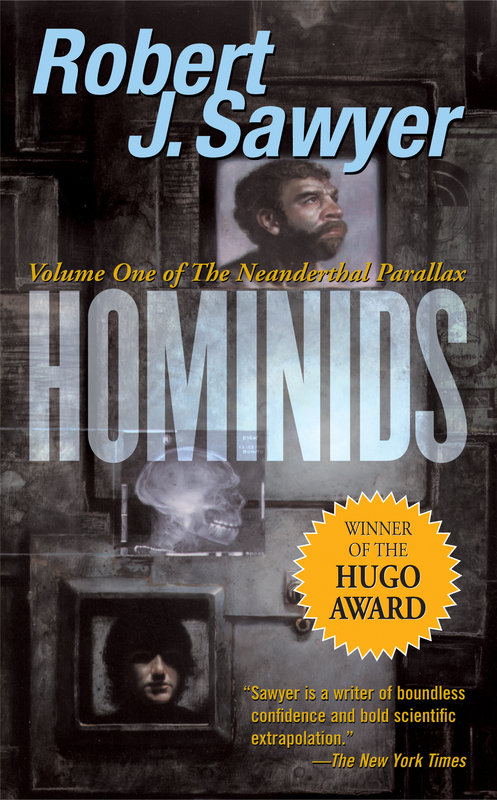 The first novel of the popular Neanderthal Parallax trilogy, Hominids, was the selection for One Book, One Community 2005. During a risky experiment deep in a mine in Canada, Ponter Boddit, a Neanderthal physicist, accidentally pierces the barrier between worlds and is transferred to our universe. Hurt but alive, he is almost immediately recognized as a Neanderthal, but only much later as a scientist. He is captured and studied, alone and bewildered, a stranger in a strange land. Boddit is befriended by a doctor and a physicist as well as geneticist Mary Vaughan, a woman with whom he develops a special rapport. Meanwhile, Boddit’s partner, Adikor Huld, finds himself with a missing body, suspicious people all around, and an explosive murder trial that he can’t possibly win because he has no idea what actually happened. Contact between humans and Neanderthals creates a relationship fraught with conflict, philosophical challenge, and threat to the existence of one species or the other — or both — but equally rich in boundless possibilities for cooperation and growth on many levels. Robert J. Sawyer, winner of the 2003 Best Novel Hugo Award, is known as “the dean of Canadian science fiction”. He is also a past winner of the Science Fiction and Fantasy Writers of America’s Nebula Award, the Arthur Ellis Award from the Crime Writers of Canada and nine Canadian Science Fiction and Fantasy Awards (“Auroras”). Sawyer’s seventeen novels are top-ten national mainstream bestsellers in Canada. Frequently viewers will catch Sawyer on television as a guest on such shows as Canada A.M., Saturday Night at the Movies, Discovery Channel Canada, and CBC Newsworld. Sawyer has taught writing at the University of Toronto, Ryerson University, Humber College, the National University of Ireland, and the Banff Centre. He has been Writer-in-Residence at the Richmond Hill (Ontario) Public Library, the Kitchener (Ontario) Public Library, and the Toronto Public Library’s Merril Collection of Science Fiction, Speculation and Fantasy. He was born in Ottawa in 1960, and now lives just west of Toronto with his wife, poet Carolyn Clink. For more information on Hominids and Robert J. Sawyer, visit Sawyer’s extensive website.